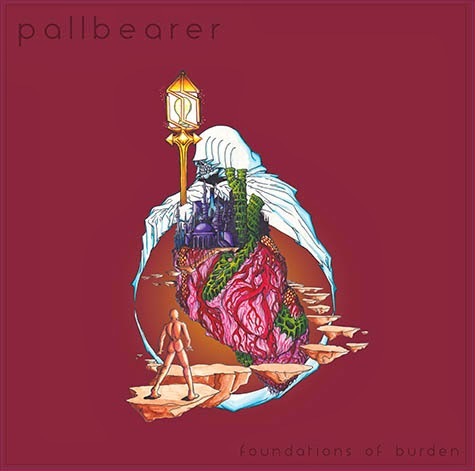 Letters From A Tapehead: Pallbearer: "Watcher in the Dark"
Pallbearer: "Watcher in the Dark"
Pallbearer put out a video for "Watcher in the Dark," one of the six pieces of solid, odyssey-driven gargantua that comprises the band's 2014 release, Foundations of Burden. While there's not much to say about the video since it pretty much only checks off boxes, (features band *check*, provides competent visual accompaniment to single *check*, seems to follow the band's aesthetic or mood *check*), the track itself addresses the band's want of expanse and intensity, summarizing riff-lust as a means of aural pulverization and melody as counter to complete ruin and subsequent transit to any note of beauty. All info, links, tour dates and video were supplied by the wonderful Rarely Unable. Watch Pallbearer's epic and cinematic new video for "Watcher in the Dark"
Pallbearer is currently on tour in North America on the Decibel Magazine Tour alongside At The Gates, Converge and Vallenfyre. Following the tour's completion next week, Pallbearer will canvas the greater part of Europe and the UK before venturing to Australia and Japan, then will head back to Europe for festival plays at Roskilde (Denmark), Radar (Italy), Stoned from the Underground (Germany), and more, with U.S. festivals like Bonnaroo (Tennessee) and Free Press Summer Fest (Houston) in their itinerary as well. Check out the band’s rigorous Spring/Summer European touring schedule below.